I HAVE found myself "At Claret" (a phrase applied to British MP Roy Jenkins), pursuing inky wines with aromas of dark fruits and graphite. 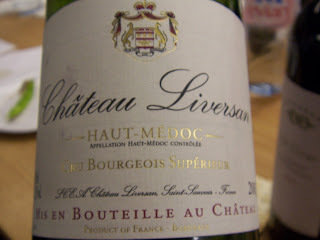 The catalyst for this expensive foray was Château Liversan '03 [£12.99, Wimbledon Wine Cellar], liquid version of a particularily high-powered student last week (I requested they bring wines which represented themselves. 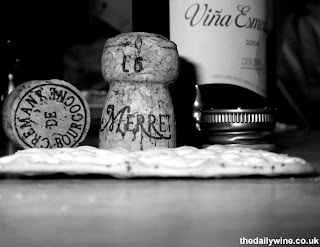 Quite amusing therefore to hear that this led two students to beg the guys at Theatre of Wine for advice!) His was intense but graceful, with dark stone fruits, cassis, slender tannins, a whisp of rolling tobacco and a discreet oak influence. Whilst fruit-forward, I still get the impression this will repay patience. Excellent, and a complement to the student. Well-heeled Château Les Ormes de Pez '98 from St. Estèphe [£19.99, Majestic] comes from the owners of Lynch Bages. Exceptional, but difficult to define. With something "animal" on the nose, the palate was soft but substantial, stylishly charming and slightly earthy, with plentiful blackcurrants, well-seasoned cigar box aromas, dusky tannins and a stir of antique dust from the pages of brittle books. Château Cos Labour '01, also from St. Estèphe, had more pedigree on paper, just breaking into the 1855 Bordeaux Chamber of Commerce Classification. Fuller-figured on the nose, the flavour spectrum on the palate was unfortunately as closed as a bank during the great depression. Prospects pend however, and I would love to meet this handsome character with at least a decade's wisdom on its behalf. For now the dregs infused class and charisma into an otherwise rustic chorizo risotto. Incidentally when trying to take Bordeaux seriously, I cannot help but think of South African, Charles Back's cannily-titled wannabe, Bored Doe!